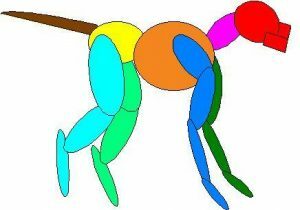 Evaluate the conformation and gait of any dog. It can be used diagnostically to determine causes and location of lameness. Post-treatment it can be used to assess rehabilitation from injuries. In the competitive dog it can be used to assess any subclinical factors that might affect performance. Canine locomotion can be used to assess the function of the body as a whole by evaluating the functions of it’s individual components. The anatomy of the dog’s body is designed symmetrically. The right side should mirror the left side. In theory then the movements of the right side should mirror the movements of the left side. This is true to an extent, with variances due to laterality, in other words some dogs are right-handed and some dogs are left-handed. To evaluate balanced body movement we can analyze canine locomotion. The common name for analysis of canine locomotion is “gait analysis”. There are various forms of gait, which are a combined result of body anatomy and velocity of movement. Gaits can be defined as symmetrical or asymmetrical. While in a symmetrical gait, the movements of the sides of the dog mirror each other. Examples of these gaits are the walk, trot, and pace. In an asymmetrical gait the movements of the two sides are not the same. The running gallop is an example of this type of gait. The best gaits to use for gait analysis are the symmetrical gaits, the walk or the trot. It is easier to pick up abnormal movement while a dog is moving symmetrically. The trot is a two phase gait, and the gait that is utilized by our CAV motion analysis system we currently using for the dog. In the trot gait, one front leg and its’ contralateral rear leg are in support, followed by the other front leg and it’s contralateral rear leg. This gait is usually used by the dog at speeds to fast to walk but not fast enough for a run. Some breeds use a pace gait instead of the trot. The pace is similar to the trot except that the right side legs are in support followed by the left side legs. Our system is capable of analyzing a dog in a pace gait. Lameness is defined as a variance from normal gait. There are two types of lameness: anatomical and pathologic. Anatomical lameness may not necessarily be from pain, and can be genetic or acquired. Pathological lameness can be neural or musculoskeletal. Musculoskeletal lameness is usually caused by pain . Two diagnostic tools to assess lameness are gait analysis and the physical exam. The amount of variance from a normal gait is defined in degrees of lameness. Most abnormalities can be detected with subjective gait analysis. A dog with a lesion causing severe sharp constant pain will carry the limb and keep the weight off it when lying down. A dull aching pain will produce a limp during the gait analysis. A lesion that produces a small pain that occurs in certain phases of locomotion allows the dog to adjust its gait for relief. The quadruped has the ability to minimize pain by altering movement in such a way that the abnormality may be unnoticeable. This altered gait can lead to subsequent orthopedic problems. Canine locomotion can be compared to a symphony orchestra playing a composition. “All parts must blend into a harmonious pattern, from the gentle sway of the head and tail for balance to the coordinated efforts of each limb and body muscle to accomplish its special function. Conversely, also like an orchestra, if all movements are not attuned to the whole, a major fault should be evident” (Roy 1971) .